Features Fixed, Two Column, Brown, Right Sidebar, Wood, Slinder. 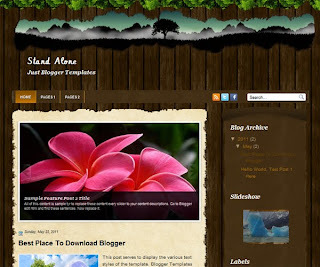 Descriptions Stand Alone is free blogger templates with wood design, feature post and very brown blogger templates, compatible on all browser, professional design and very good for your blog. Search, social bookmark and Pagelist menu is some feature on this blogger templates.